Latest update: 18 Dec 2018. Version: 2.3.0. Platform: for Wordpress. Opt-In Panda locks a portion of content on a webpage, by hiding or blurring it, and asks the visitor to enter his email address (opt-in) to unlock your content. In other words, it gives visitors a reason to subscribe right now in return to instant access to your valuable content (e.g. downloads, discounts, videos and so on). Hide your premium content behind an optin form and watch your email subscription rates burst through the roof. Easily create in-content freebies and serve them to your subscribers only. Effectively and easily convert visitors into subscribers. Build large mailing lists on MailChimp, Aweber, GetReponse (and other services). Send more emails and increase your income. Know more about visitors of your website (name, social profile). The plugin equally well works with Single Opt-In (without email confirmation) and Double Opt-In (with email confirmation) modes. Only you decide which mode to use. We done our best to make the Double Opt-In email confirmation process as quick and pleasant as possible. Gone are the days when you had to send your subscribers to a Confirmation Page. Now your visitors have to make only several simple clicks by following the instruction appearing after submitting the form to confirm their emails. View the animation below to learn how it works or try the live demo . The Opt-In Panda integrates directly with all the major mailing services and plugins: MailChimp, Aweber, SendGrid, ActiveCampaign, GetResponse, MyMail, Mailster, MailPoet (including MailPoet 3), FreshMail, Acumbamail, Sendy, K-news, SmartEmailing.cz, Sendinblue, SG Autorepondeur. Also supports any transactional mailing services (for example, Mandrill, Postmark, Mailjet, Amazon SES) and SMTP after installing respective Wordpress plugins. We are constantly adding more email marketing providers to the plugin. Moreover, the plugin saves all received email contacts locally in the database. If you use another mailing service, you can easily export your contacts from Opt-In Panda to your mailing service at any time. Except subscription via the classic opt-in form, the plugin also provides visitors an option to subscribe through social networks. When the user subscribes via social networks, the locker extracts some personal data (name, social profile). This data provides a better understanding of your audience and visitors on your website. For each social button, you can configure extra actions which should be performed when the user clicks on the social button. 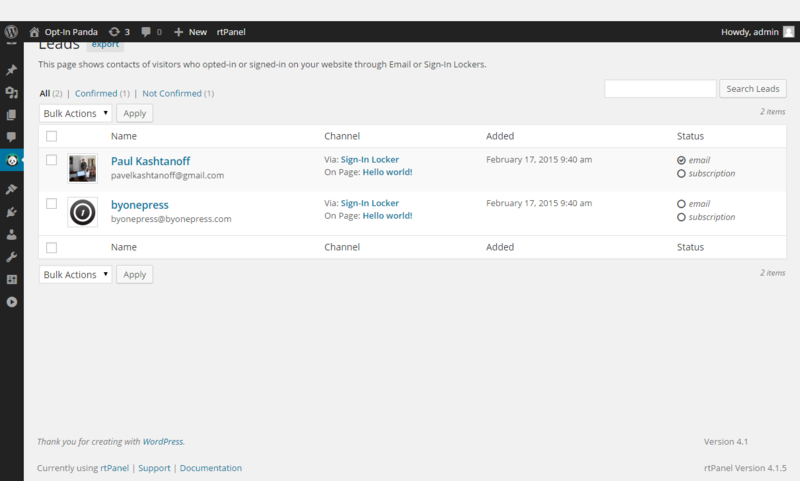 For example, you can set up the locker to create an account for the user on your website. 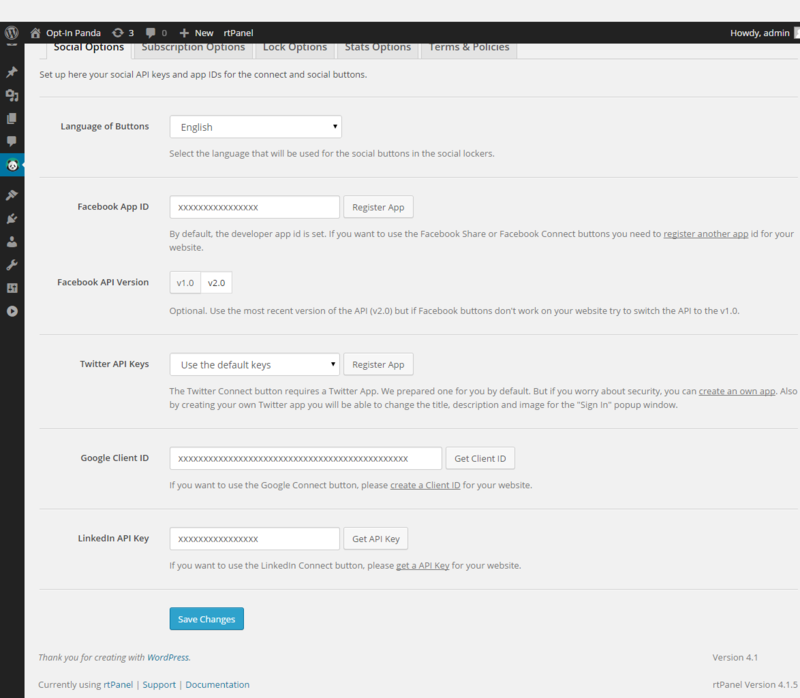 Note: you can extend the features of the Opt-In Panda by installing the Social Locker plugin. It makes available more actions (tweet, follow, subscribe to Youtube channel, etc). The Opt-In Panda allows you to choose how the locked content has to be displayed: completely hidden or partly visible. One of the available overlay modes is the blurring mode. It attracts tremendous attention and create huge interest to your locked content. If people see and understand what they will get after unlocking, they are more likely to leave their emails. Custom Fields are a great way to customize your Opt-In Panda forms for your specific business needs. Need to ask your visitors for a phone number or address? No problem! You can create custom textboxes (with/without input mask), dropdown lists, checkboxes and more. Values from the custom fields are saved directly in your mailing provider and available to export in CSV format. 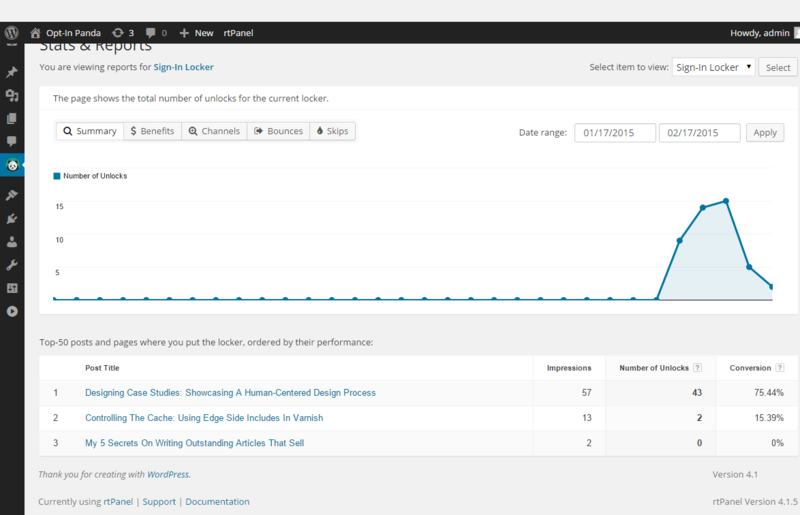 The plugin collects the full stats (impressions, conversions) on how your lockers perform on pages of your websites. Easily identify which lockers on which pages are out-performing others, how to optimize your lockers and what you could do differently to improve your results. With the Opt-In Panda, you get 3 styles available to use out of the box. Every style was polished by a professional graphic designer and has been tested on real websites to ensure that they will catch the visitors attention. Each website has its own unique audience and needs. Therefore, the Opt-In Panda provides you with advanced features to customize any aspect of your lockers. 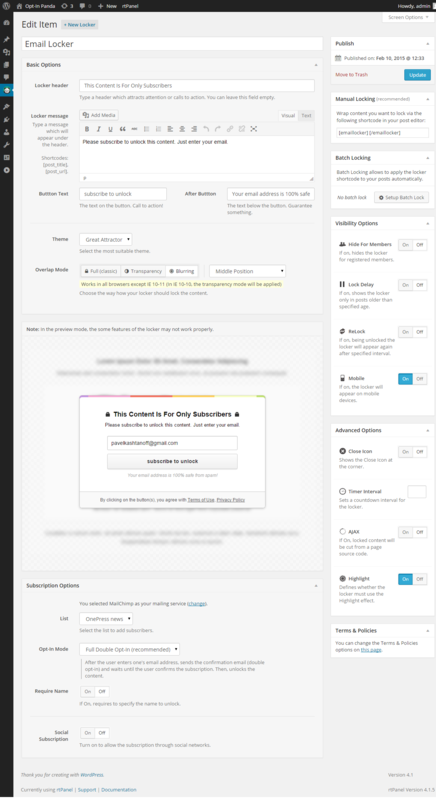 There are plenty of additional options to configure Opt-In Panda flexibly to meet your needs. For example, you can add the countdown Timer, or the Close Cross to skip the opt-in process, or hide your lockers for registered users and more. GDPR-ready. Opt-In Panda is fully GDPR-ready. Just enable the Consent Checkbox option in settings of your locker. Zapier Integration. Send data collected with your lockers to Zapier and then automatically pass them to thousands of web apps supported by Zapier. Works With Caching Plugins. If you use W3 Total Cache or any other caching plugin, the Opt-In Panda will work without any problems. SEO friendly. Your locked content is still visible for search bots for better SEO by default. Of course you can turn off this feature. 4 Types of Locks. Lock any content manually via shortcodes or setup batch lock via one of 3 powerful modes (“Skip & Lock”, “More Tag”, “CSS Selector”). Optimized For Mobile. We have adapted the plugin for mobile devices. Mobile users can obtain access to your locked content as well as desktop users. Smart Targeting. Set your lockers to display on specific high traffic pages on your website. Show the locker only for non-registered visitors or PC users. Delayed Content. Load your locked content via ajax (dynamically) only when the user is liked or shared your page. Perfect for loading promo codes. Fast Loading. The plugin is well optimized and doesn’t add extra loads on your website. Confirmed with tests from the P3 plugin and New Relic. Developer Friendly. Use the plugin events (Unlock, Lock, Ready) and hooks for customization and creating your own extensions. All of our plugins come with free support. We care about your plugin after purchase just as much as you do. We want to make your life easier and make you happy about choosing our plugins. We have a help desk setup for our users, making it easy to fill out a ticket. We guarantee to respond to every inquiry within 1 business day (typical response time is 3 hours). ADDED: Support for Wordpress 5 and Gutenberg. UPDATED: Instructions on how to create social apps. FIXED: A set of minor bugs. FIXED: The error in the file leads.php #350. ADDED: Zapier integration. Send data collected with your lockers to Zapier and then automatically pass them to thousands of web apps supported by Zapier. ADDED: Blocking Temporary Emails Addresses. Get only real leads interested in your services (optional). ADDED: Support for PHP 7. Speed up your Wordpress site by running it on the newest PHP version. UPDATED: The Help Section was supplemented by new pages: Zapier Integration, SSL Certificate. ADDED: An option to display the Consent Checkbox to process personal data received via lockers. ADDED: Support for fields added as custom HTML code. FIXED: A bug when the plugin displays the limited number of MailChimp groups. ADDED: Custom fields in notifications when new leads are gained. FIXED: ActiveCampaign integration (custom fields). FIXED: A lot of major and minor bugs. FIXED: MailChimp Invalid Resource error. 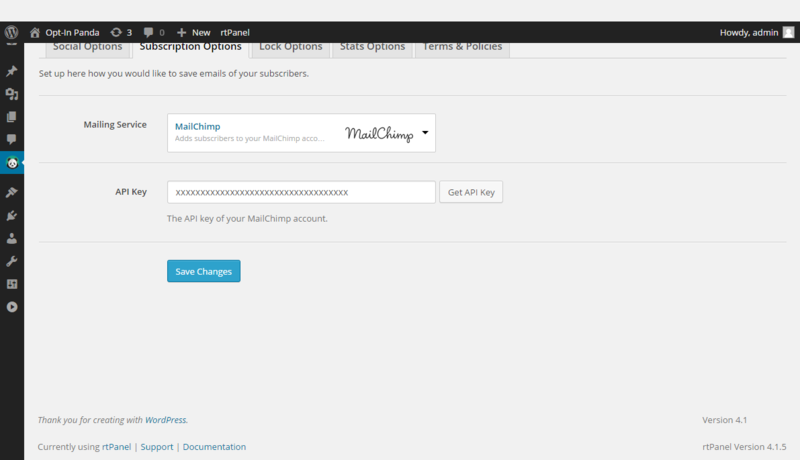 ADDED: Support for MailChimp Groups. ADDED: Support for MailPoet 3. UPDATED: Guides on how to register apps on Facebook and Google. ADDED: In-App Browsers option – control how the locker should behave in mobile in-app browsers (Facebook In-App browser, Twitter In-App browser, Instagram In-App browser, VKontakte In-App browser). Check it out on the page Global Settings -> Lock Options. FIXED: A bug of the page Leads when only the first 20 leads are visible. FIXED: A bug of the Visibility Conditions when the locker doesn’t appear if any Advanced Visibility Conditions are set. ADDED: Lock Delay – make the locker to appear only after a specified interval. ADDED: Permissions Settings – configure roles and permissions for getting access to the plugin features. ADDED: Notifications – get email notifications about new leads and unlocks. ADDED: Clone Feature – quickly create new lockers based on options of existing ones. IMPROVED: MyMail, Mailster and MailPoet integrations. IMPROVED: Compatibility with mobile devices. FIXED: A lot of minor bugs. NEW: Integration with SG Autorepondeur. NEW: Added the Double Opt-In option for all autoresponders/services what have not supported it earlier. FIXED: A lot of other minor bugs. NEW: Added support for ActiveCampaign. NEW: Added support for Sendinblue. NEW: Added a new type of custom files – hidden fields. NEW: For autoresponders that support at the same time single and double opt-in modes, the sign-in locker doesn’t ask the user to confirm one’s email after subscription via social networks. IMPROVED: The button Twitter Sign-In now receives an email address of the user (by default works only with the default Twitter app, for custom apps, please see the updated section “How to create a Twitter app” in the help section of the plugin). IMPROVED: Added support for Facebook API v.2.5. IMPROVED: Compatibility with websites using SSL. UPDATED: The LinkedIn Sign-In Button. Please update its settings on the page Global Settings -> Lock Options. FIXED: A bug when Facebook does not return an email of the user when using Facebook API v.2.4+. FIXED: A set of security issues. Important: if you use CDN, please purge your CDN after installing this update. Important: if you use the LinkedIn Sign-In button, please update its settings on the page Global Settings -> Lock Options. NEW: Compatibility with WP 4.3. NEW: The brand new Visibility Options. Allows to show/hide the locker depending on the User Role, User Registration Time, Mobile Device, Count of Page Views, Landing Page, Referrer, Current Page and other parameters. NEW: The Debug option explains now why the locker is not visible (Global Settings -> Lock Options -> Debug). FIXED: A set of bugs of the Batch Lock. FIXED: The bug when the plugin doesn’t unlock the content when using MyMail. NEW: Added an option to hide the License Manager. ADDED: Custom fields. Now you can configure which fields are visible on the form. ADDED: Pass Code. This feature allows to hide lockers if the pass code is specified in the URL. IMPROVED: Compatibility with WP 4.2. ADDED: Support for the Visual Composer (including the Batch Lock for content generated via VC). ADDED: Support for Facebook API v.2.3. FIXED: The error “Invalid params” when GetResponse selected. FIXED: The bug of the option Timeout. FIXED: A lot of other minor bugs which have been reported by users. IMPROVED: Performance of the plugin. FIXED: Conflicts on using different versions of OnePress plugins. FIXED: the bug of not displaying the TinyMCE editor when the plugin is activated. FIXED: the error “Call to undefined function opanda_get_panda_item_ids”. FIXED: A lot of minor bugs reported by users. Important: If you use the Social Locker plugin or StyleRoller Add-On, update them after installing this update. FIXED: The Tweet and Follow options of the Sign-In Locker. FIXED: The bug when leads were not saved while using the Sign-In Locker. FIXED: The bugs of displaying the plugin in IE8. ADDED: The option Redirect To Locker for the plugin K-news. FIXED: The bug when the MyMail confirmation link leads to the page returning the error 404. ADDED: Integration with the plugin K-news. 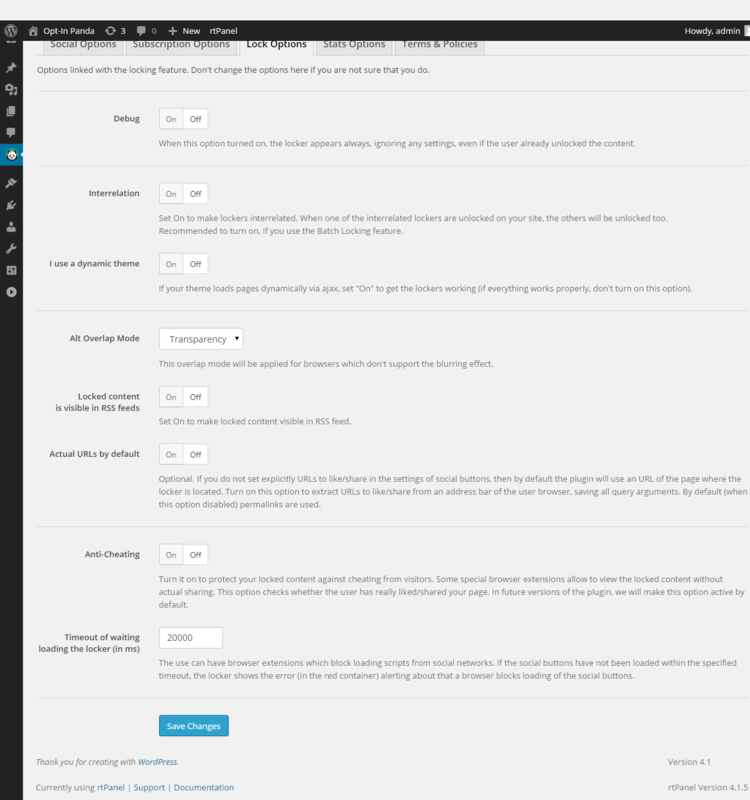 ADDED: The section “Front-end Text” on the page Global Settings to customize secondary front-end text. IMPROVED: Submitting the opt-in form on pressing the Enter button. ADDED: Integration with the MyMail plugin. ADDED: Integration with the MailPoet plugin. ADDED: An ability to export emails in the CSV format. ADDED: The action “Save Email” for the Sign-In Locker. 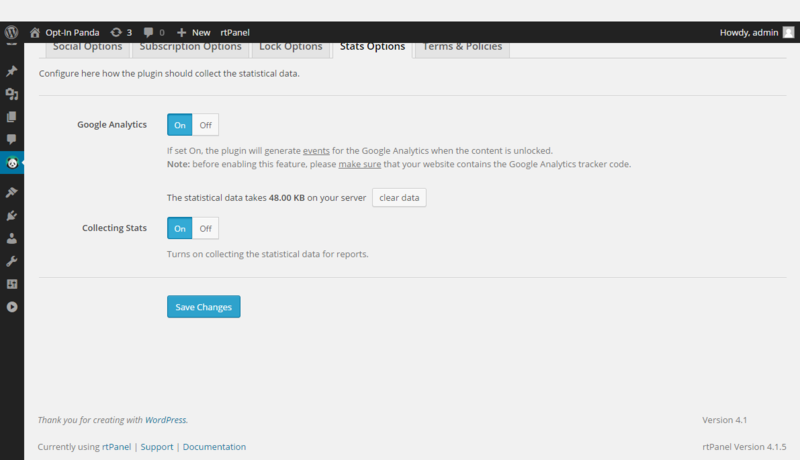 FIXED: Integration with Google Analytics. FIXED: The error: Control “%s” not found in the group “subscription”. FIXED: Several minor bugs of collecting stats. FIXED: The button Clear Data in the section Stats Options of the page Global Settings. NEW: Added new reports on the page Stats & Reports: Benefits, Bounces (warning: all previous statistical data will be removed after installing the update). IMPROVED: The section “How to use?”. FIXED: Minor CSS fixes for a better look.